We spend most of our lives under ceilings that trap smoke, odor, grease, dust and other pollutants. They look bad and can quickly become a sanitary problem. As your certified Ceiling Pro dealer, AP Cleaning uses proprietary Ceiling Pro solutions to clean and restore your ceilings. Much of our work is with acoustical and vinyl tile drop-ceilings, but we can handle any type. Using our industry-leading expertise and 18 eco-friendly products, we make your ceilings look new again without being painted or replaced. Cleaning your ceilings brightens your facilities. It disinfects and deodorizes, and extends the life of your ceiling system. Hiring AP Cleaning is a wise investment that your customers can’t help but notice. That’s why so many restaurants and bakeries use Ceiling Pro dealers on a regular basis. Our proprietary solutions tackle specific problems we encounter at each site. The mixture reacts with the dirty surface to remove the soiling without damaging the ceiling or walls. Best of all, cleaning and maintaining your ceilings costs approximately 80% less than replacing them! Why AP Cleaning & Ceiling Pro? 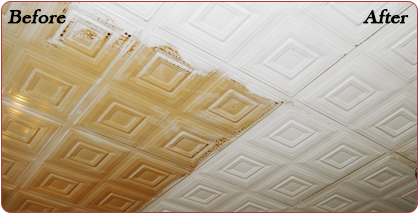 Our Ceiling Pro products and service can save your business money! Extends the life of older grid systems and gives them a new professional look. It eliminates the tremendous expense of replacing or painting grid systems. Grid Cover conceals rust, chips, gaps, and age on existing grid systems. Don't be fooled by low quality imitations of Grid Covers. Only Ceiling Pro grid covers are manufactured to ensure long life and are available exclusively through Ceiling Pro. Cost effective alternative to replacement. It is a scientific formula that restores acoustical tiles to their original form and beauty. It can be a much cheaper alternative to tiles that can no longer be cleaned. Because of our experience with a variety of surfaces our knowledgeable crews can complete minor or even major repairs to ceilings or ceiling components. Contact us to discuss any job!